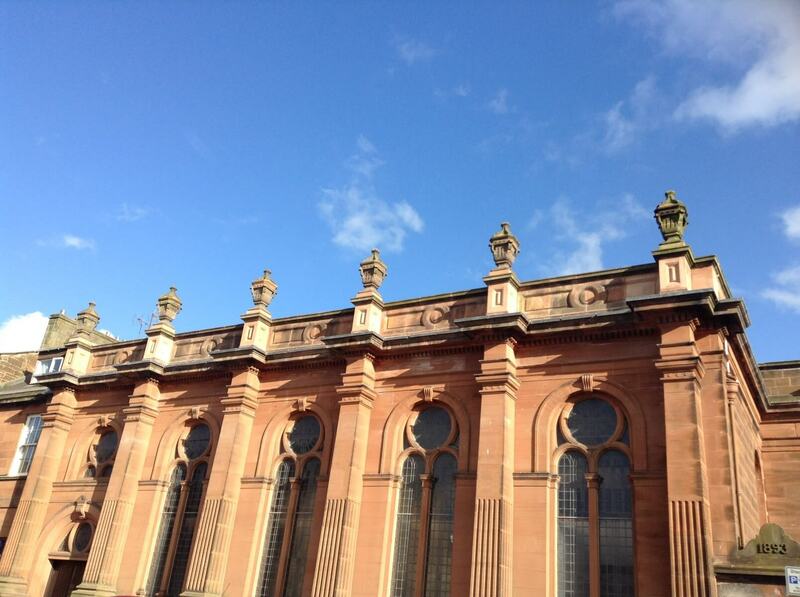 Dumfries has a population of around 32,000. St George’s currently has around 550 members, each with a range of skills and talents which are utilised to further the work of the church. We always welcome visitors and new members and aim to ensure everyone receives a warm welcome when they visit St George’s. Rev Donald Campbell was inducted as the Minister of St George’s on 27th November 1997. Donald is supported by Pastoral Assistant, Rev Colin Sutherland. The Kirk Session is responsible for the work of the congregation. It is made up of elders and the minister. Members of the congregation are grouped into districts and each elder is responsible for the pastoral care of a district. The Kirk Session also determines the times of public worship and the number of services. The Kirk Session meets 4 times a year usually on first Monday in February, June, September and December. The Kirk Session has responsibility for worship including the timing of services throughout the year. We believe that Jesus was the son of God who was born like us, lived like us and died like us. We believe that he rose from the dead and is alive and active in the world today through the Holy Spirit. We believe that through Jesus we can have fullness of life through a relationship with God. We believe that Jesus asks us to love God, to love others and to proclaim God’s love for human beings to the whole world. The Discipleship Group encourages and supports members of the congregation on their faith journey. The Discipleship Group aims to encourage members of St George’s to engage in a number of initiatives including Bible Study and Prayer. The group also aims to encourage people to participate in Church Services through there involvement in Bible readings, Prayers of Intercession and Offering Prayers. We are always keen to hear from anyone who would be interested in being becoming more involved in leading and supporting worship. Flower Ministry also sits under the leadership of the Discipleship Group. Most groups within St George’s deliver some form of outreach, but the Outreach Strategy Group seeks to reach out to those harder to reach groups within the community. Current examples include various projects to increase engagement with children and young families including the development of Messy Church and Sunday Tots. There have also been suggestions about the need for a male social group, walking group and cycling group – if you are interested in getting involved in any of these initiatives or have any new ideas, then please get in touch. The Pastoral Care Group helps to identify the pastoral care needs of the congregation and offers a number of important pastoral care and bereavement services to those who require it. The Communications Team reports to both the Kirk Session and Deacons’ Court. The Communications Team helps to manage and support the communication needs of St George’s Church and groups including the production and maintenance of the website, social media, Focus magazine, project newsletters, postcards, flyers and display stands as well as press and media relations. The team can advise or assist any church group with marketing and communications tasks as required. Three editions of the Focus Magazine are created in-house by the Communications Team each year, with contributions from various members of the congregation and church groups and with support from a small team of proof readers. Copy deadlines can be found in each edition and in Church News. Web content and social media posts are also supported by other members of the congregation throughout the year. Anyone wishing to share information or news should contact the Communications team: John Glover (Convenor) or Caroline Bell. Many other groups and individuals regularly contribute to the management of weekly communications tasks and should also be informed of relevant news and information for their purposes too including the Session Clerk, Clerk to Deacons Court and the Church News, Screen, Sound and Projection teams. Kenny Simpson has responsibility for maintaining the St George’s Communion Roll, while Evelyn Henderson maintains the Cradle Roll. The Kirk Session has the responsibility for meeting Data Protection and Safeguarding regulations. Protecting Vulnerable Groups (PVG) is required within organisations dealing with children and vulnerable adults and all our leaders and helpers who deal with children within St. George’s have all been through the PVG process. St. George’s Church has, at present 28 members who have a PVG certificate and courses are run periodically to train new members and refresh the process for existing members. We also have a recycling centre at the information desk the proceeds from which go to overseas initiatives. This is a great way of clearing out your cupboards and helping people at the same time. Christian Aid also receives a donation for every mobile phone and each recyclable ink cartridge that our supporters return through the scheme. Donations can be left in the recycling box at the church information desk. Vision Aid Overseas runs a nationwide spectacle collection scheme which operates to raise money for Vision Aid Overseas and ensure spectacles are recycled in an environmentally-friendly way. Donations of spectacles can be left at the church information desk. During 2018, a new Planning Group was established to encourage Convenors to share information about their plans for the months ahead and to help co-ordinate an Events Calendar for St George’s. The Deacons’ Court deals with the Finance and Fabric of the church. It comprises the members of the Kirk Session and 25 other members who are elected for a three-year period. It usually meets four times a year on a Monday evening in January, March, June and October. If extra meetings are required they are usually held immediately after the service on a Sunday. It is the Deacons who make up the teams who greet people on a Sunday, set up the hall, count the collection and tidy up the church after the service. The Finance Committee meets on a monthly basis to monitor church finances and to ensure compliance with OSCR regulations. The team reports on a regular basis to the Deacons’ Court and annually at the AGM. The Committee is also involved in supporting the management of other project funds and donations as well as managing banking, accounts, funding applications and Gift Aid returns. Key contacts: Rosemary Murray (Finance Convenor), David Gibson (Treasurer), Gail McAdam (Gift Aid Convenor), Rosemary Murray (Freewill Offering Convenor) and Ian Jess (Session Clerk). The Fabric Committee takes responsibility for the maintenance of St George’s properties and fabric including the church, the church hall, the manse, the flat, garden and car park. The team also have responsibility for Health & Safety matters including fire safety. Contact: Fabric Committee Convenor, John Dickson. The Health & Safety Committee is a sub-group of the Fabric Committee under the leadership of the Fabric Convenor, John Dickson. The Social Group provides a varied and interesting programme of entertainment for members of St George’s and the wider community. The events are varied and include, everything from Burns suppers and trips to the pantomime to concerts and quiz nights. The Social Group also provides support for other church events. The group meet regularly to plan activities throughout the year, and welcome ideas and support from the wider congregation. For details of forthcoming events keep an eye on News and Events. 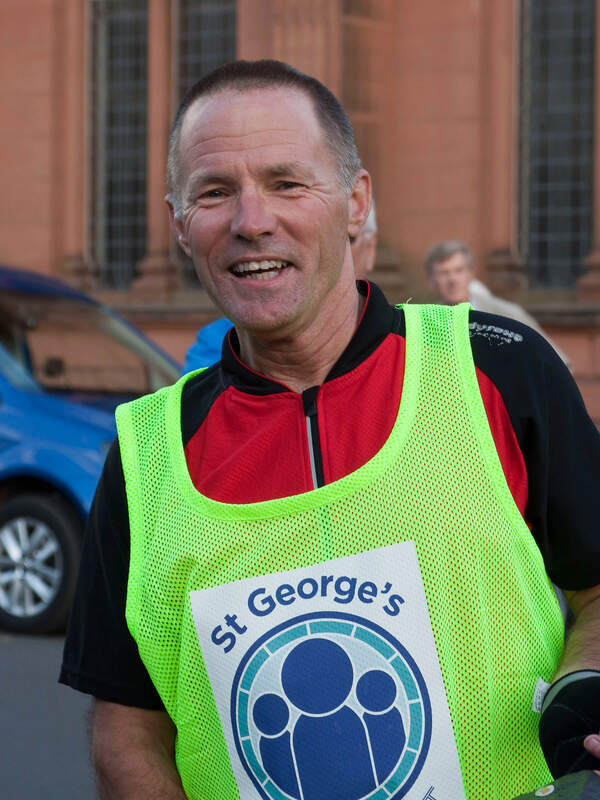 St George’s is very active in the local community and is keen to engage with local groups, organisations and individuals in Dumfries and surrounding areas. Our BE PART OF IT team made up of volunteer members works throughout the year to create and strengthen local partnerships, increase internal and external engagement in church projects and social gatherings and at the same time helps to boost church funds through fundraising activities to help sustain St George’s charitable and outreach work in Dumfries. This is further supported by other groups of dedicated and enthusiastic members. You can find out more about our community projects and forthcoming events on this site. Highlights so far have included a family ceilidh, ukulele concerts, golf competitions, sponsored cycles, regular quizzes, themed talks, art shows, baking stalls, various February fundraisers, fashion shows, pop-up shops and concerts. If you have an outreach or fundraising idea please get in touch or if you want to get involved in the group or any of our projects just let us know – we want you to be part of it. St George’s Toddler Group meets in the church hall each Monday morning during school terms from 9.30am until 11.00am. Everyone is welcome to come along and make new friends and strengthen existing ones. The age range is from birth to school age. The youngsters have a lot of fun playing together. Tea, coffee, juice and biscuits are served. Each December we have a Christmas party and each June an outing, usually to Dalscone Farm Fun Park and all for £1 each week per adult. Sunday Tots and Kids Club take place on a Sunday morning from 10.45am to 12noon in the Church Hall. At 11am everyone spends around 15 minutes in the Church before going back to the Church Hall for stories, craft and games. On the first Sunday of each month we have a themed event suitable for families with young children. All welcome. Contact: Kids Club Leaders, Shirley Campbell and Jane Magee. Messy Church is an alternative opportunity to meet together for worship on the last Wednesday of every month in the Church Hall. We listen to and think about the Gospel through games, stories and messy activities. There’s faith, fun and fellowship for everyone from 1-99. Messy Church starts at 3.30pm for snacks and drinks with the fun beginning at 3.45pm until 4.45pm. If you would like to know more or can offer your help with Messy Church please get in touch. St George’s Craft Group was formed in October 2012 to contribute to the first St George’s Christmas Market. The group was established with the purpose of bringing together members of the congregation to utilise their creative talents by making craft items to sell at the market as well as to encourage the sharing of craft skills and to provide another informal social platform for members of the congregation. Since it was established membership of the group has evolved and they have contributed significantly to church funds and supported other charities through the sale of their creations and the annual Christmas Fayre and other outlets. The Craft Group also knit and donate hats and blankets to the neo-natal unit at Cresswell Maternity Hospital at DGRI and can often be found knitting poppies and Easter crafts too. The group meet regularly on a Wednesday evening in the Church Hall from 7-9pm throughout the year. New members and visitors are always welcome and are always looking for people to share their skills and talents with others. For details of forthcoming meetings see What’s On. During church services the music is provided by Grace McBain (organ and piano) and Ewen Flint and David Mowat (guitars). We are keen to involve others who play musical instruments. From time to time a singing group is formed to rehearse and present items of worship. We would like to develop this further by having singers help introduce new praise items. This would include distributing music and internet links to new songs in advance and inviting groups of singers to lead those songs from the front of the church during services. Please speak to David, Ewen or Grace about being part of music in our church or if you have any suggestions. The Monday Readers Group meet in Georgetown Library on the first Monday of every month. New members are always welcome. The Book Dragons meet together once a month to share fellowship and a love of books and reading. The group provides a chance to meet people from varying backgrounds and walks of life, to forge new friendships, to develop and build relationships and to learn from others. Reading for pleasure within a small group such as the Book Dragons, promotes empathy and inclusion. There is an opportunity to try new authors, new titles, and new subject material, thus broadening horizons. Communication within the group is essential. A sharing of opinions and ideas can do wonders to a person’s confidence and self-esteem, knowing that each member is valued and listened to. Reading books provides ample opportunities to discuss issues about life in today’s world and to share faith and beliefs. The Book Dragons promote reading groups and would love to see more of them set up. We offer advice and support to help anyone achieve this, using our God-given talents to reach out and build relationships with others. The group meet monthly at 9.30am in Polka Dot Gift Shop and Tearoom on Castle Street. Please also see details of Monday Readers. For details of forthcoming events visit What’s On. Thursday morning bible study takes place on alternate Thursdays at 10.30am in the church office. For more information please get in touch. Every week individuals or families donate flowers for display in church and at the war memorial during the Sunday service. The flowers are later distributed to members, often those who are ill or bereaved, after the service. To donate flowers or to help with the packaging and/or distribution of flowers on a Sunday please speak to the Flower Team who will be happy to add you to the rota. THose who receive flowers are always very grateful, so please accept our thanks for donating flowers. Teams of volunteers from St George’s Church augmented by friends and colleagues from other churches, workplaces and the Rotary Club of Dumfries have been providing a regular hot meal for homeless, needy and socially excluded clients within our local community. The need for such a service is ever more pressing in these times of financial constraint and social pressures. Meals are provided in St George’s Church Hall every Thursday from 7.00 -8.00pm. Meals provision is organised on a one week in every six team rota basis. Each team is responsible for the menu, food preparation and service in their week on duty. Teams prepare the food in advance and set up from 6.30pm before opening time. Those in receipt of the service are very appreciative of the efforts made on their behalf. Anyone who wishes further information, or who feels that they could contribute to the meals project by volunteering, should get in touch. Everyone is invited to share fellowship in the church hall after the Sunday morning service, where tea and coffee is served. Voluntary members of the congregation take turns to make and serve tea and coffee after each service. If you would like to help please get in touch. The Projection Team project the hymns, videos, photographs and slides onto the screen during Sunday morning and other services. It is a small team, which means members are on duty once a month, but if new members would like to join the team we may be in a position to reduce this to once every six weeks or so. We also also cover three or four Presbytery meetings a year, which are on a Wednesday evening. The actual projection is not difficult and full training is given before you would be let loose on your own! Those who do it, find it satisfying to be able to provide this important service on a Sunday. When you are on duty you are required to be at church about 10.40am. A small technical team at St George’s co-ordinates the church sound system during services and events in the church. Dumfries & Kirkcudbright Presbytery meet in St George’s and team members also cover these meetings for sound requirements. Occasionally conferences and concerts are held in the Church. If organised by outside agencies the Sound Team works closely with these organisations, helping to build relationships within our community. Weddings, funerals and school services are also held in St George’s and often require input from the team. If you can help support this work, particularly mid-week, please get in touch. Each week, willing members of the congregation contribute to the church service by leading the prayer of intercession or by reading the bible reading(s). If you are willing to volunteer to join the rota for prayers and/or readings please get in touch. A small team work together each week to create and print the Church News sheet for distribution on a Sunday morning. The Church News sheet includes the Order of Service as well as news items from church groups and relevant intimations from outside sources. Anyone who would like to put forward news items should email churchnews@saint-georges.org.uk by a Wednesday evening at the latest. Church News is handed out on a Sunday morning. It is also posted on the church noticeboard. The Church organist, Grace McBain leads the band. Grace routinely switches between the organ and the piano and is supported by a number of talented musicians. A short-term project team was set up in 2018 to lead and support the implementation of of the Church development project. See Current Projects for details. Our Daily Bread Bible Notes are available every month for anyone who would like to receive a copy. Individual copies can ordered in advance. There is usually a spare copy in the library book shelf in the Church vestibule. There is an opportunity to subscribe to Life & Work Magazine. For details or renewal information please get in touch. At St George’s we recycle spectacles for Vision Aid, ink cartridges for Christian Aid and stamps for Leprosy Mission Scotland. We now have a new charity on board called Playlist for Scotland and they make up playlists for people who have dementia and other memory problems and they are looking for ipods, ipod shuffle, MP3 players etc. Donations of spectacles, ink cartridges, stamps, ipods and MP3 players can be deposited in the relevant boxes located next to the church information desk. A Food Bank Collection Point is located next to the Information Desk in the vestibule of the church. Donations can be handed in throughout the year and are taken to the local food bank on a regular basis. Unfortunately, there is a growing need for this service and even more so during school holiday periods. Please feel free to donate at any time of the year. Thank you to those who support this very worthwhile initiative. The badminton club welcomes any adults or older teenagers who wish to play badminton. You don’t have to play to Olympic standard! If you just want to have some exercise in a relaxed and not overly competitive environment please come along. We would welcome new people to join us on Thursday evenings at 7.30pm in the Church Hall.